All-glass automatic revolving doors, combine cutting edge research and quality materials to enhance the style and appearance of the facade of any building. Available as a 3 or 4 wing version, offering various functions, ranging from any form of access control system, activated from the entry or exit side to a Shock-Stop function. 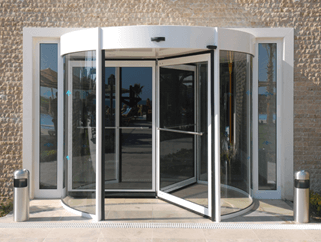 This unique revolving door design boasts probably the most robust and servicable unit available in the market place, combining transparancy and style without compromise.